LOL! Michael you are hilarious! 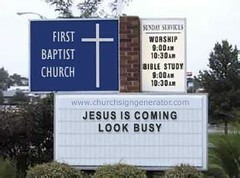 Do we have a timeframe so I know when I have to look busy? Greg - See that's the good thing about religion, the timeframe is ongoing, heck it's been going on for 2000 years already!